The former Adaptive Riding Institute has been re-named Horses of Hope, to show the welcoming spirit that resonates within our stable, and our community of clients, volunteers, staff, board of directors, donors, and sponsors. We wish to give credit where it is due – to our incredible group of therapy horses that make everything possible. Learn how you, or a someone you care about, can be part of Horses of Hope and participate in this life-changing, therapeutic riding experience. 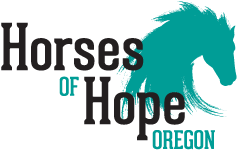 If you want a volunteer experience that positively impacts your life forever, join our Horses of Hope volunteer team. Volunteer regularly or help with a one-time project. Your contribution to Horses of Hope supports our horses, our volunteers and our facilities and will allow us to continue to provide our riders with quality equine therapy experiences. Learn how you can help us. I understand the difference that I am making when I go clear brush or clean the facilities. By volunteering, I allow the hard-working staff to spend more of their time helping disabled people throughout the area. By taking my fraternity of 25 men out to their facility, we are able to assist with chores that could take a small staff a long time to perform. By helping for three hours, we give the staff more time to continue making an incredible contribution to the Mid-Valley community.